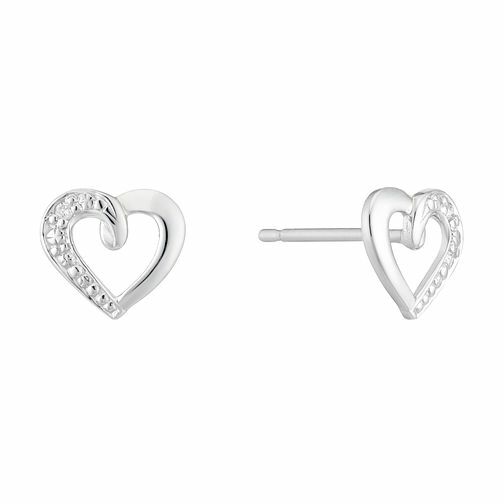 Express your loving and caring nature with these 9 carat white gold heart shaped stud earrings. Set with stunning round cut diamonds, these earrings are the perfect combination of sweet styling and subtle sparkle. 9ct White Gold Diamond Set Heart Shaped Stud Earrings is rated 4.5 out of 5 by 2. Rated 5 out of 5 by Anonymous from Got my girlfriend this for Christmas. Looks lovely and well worth the money paid. Will be buying from H Samuel again. Rated 4 out of 5 by Anonymous from Very neat This product was a gift for my granddaughter who is delighted with it.